This being the first Sunday of Advent I came home from church and decided I would inventory my Christmas record collection. It is very exciting for me, because I never know at any point in time exactly what I have. You would not believe the treasures I found! First there were the two classics pictured above. The record on the right is of Tchaikovsky's "Nutcracker" Suite. I don't know how that woman's face ended up on the cover but you have to love it. I don't want to make everyone all jealous, but how about these two? Click on the picture to get the great details of the Gladys Knight album cover. Observe the hi-fi, visible beneath the records. Here is the record that had been lying on the hi-fi to begin with so I thought I would take a picture of it. It is always restorative to look at Leonard Pennario album covers so here is another one. This is the picture I always used to joke was his bimbo picture. Every great artist has one, where he is posed and airbrushed until he looks completely vacuous. Ha, ha! Not a thought in his head! I miss laughing with Leonard over stuff like that. Here, next to "Rhapsody Under the Stars" (one of the records I scored with the hi-fi) is another Christmas classic. Click on it and you will see why it is so great -- it came from the A&P! This is a record we had when we were kids, but I found another copy for my very own. There is a hilarious story attached to this record. All the girls in our family were sent to, ahem, the Buffalo Academy of the Sacred Heart (BASH) and once my sister Margie brought in this record for Christmas Mass. She was supposed to play "Silent Night" at Communion time but she put the needle on the wrong track and instead of "Silent Night" the big group of 400 girls was treated to this booming track titled "The Bells of Germany," or something like that. BA-GONG, BA-GONG, GONG, GONG, GONG..." At top volume! Margie was laughing so hard she could not take the needle off the record so it just went on and on. Ha, ha! That is a story that is always told in our family at Christmas time. It is probably also still told in the halls of Sacred Heart. I hope this exposition helps everyone out there in Blog-O-Land see your Christmas record collections through new eyes! And if yours can't compare with mine -- well, whose can? -- pssst! I hear there's a sale at Amvets today. This is the way I feel now that Thanksgiving dinner is behind me. The day began long before dawn. The oven was on by 6:30, and the pies were in the oven by 7. By 8 the stuffing was done. By 9 I had tackled the insidious, the dreaded, the unholy downstairs bathroom. At 10 I recklessly took a break and made it to Mass. On the way into the church I saw the Turkey Trot runners circling Niagara Square. I was not the only one having an exciting day! The priest ended the Mass by chanting the Te Deum. It is a powerful prayer that goes back to the 5th century and we were told it has been sung over the centuries at great moments of triumph, such as an ordination, a coronation, a canonization or -- I liked this -- a military victory. The Te Deum is cousin to the Non Nobis Domine, the short prayer sung in "Henry V." Before the famous scene we just saw, you can hear Ken Branagh, as King Henry V, decreeing that the Te Deum and Non Nobis Domine shall both be sung now that the Battle of Agincourt is over and 10,000 Frenchmen lie dead. The big victory of my Thanksgiving is that although it was complete chaos, it was fun. I loved it which was partly because I had a lot of help from my sisters, Katie and Margie, who was visiting from New Jersey, and my mom, and my brother-in-law David, who sharpened my knives.. yay! We had the usual moments of drama culminating in when we burned a chair. I do not know exactly how it happened because mercifully I was in the other room drinking wine, but all I know is my 4-year-old nephew Georgie ground crayon into a chair and then someone tried to fix it and somehow in the process the chair burst into flames. All I could think of was "Bean," the part where Mr. Bean wrecked "Whistler's Mother." I am still laughing about it (the chair, and "Whistler's Mother"). Georgie is like this little typhoon. He runs around like an orangutan, on his hands and his feet, and as Howard put it, Georgie has transcended the limits of his body. His body cannot contain him. I will have to find a picture of him and post it. Better still, a video, to capture him in action. My house survived him running amok! For that we sing the Te Deum. We will sing another one when I finish my book on Leonard Pennario. Has anyone else notice that when you are out and about -- shopping, whatever -- no one tells you "Happy Thanksgiving"? Everyone says, "Have a nice holiday." I get that bit about being safe ALL THE TIME. Just yesterday I was told that something like five times. And I do not understand it. What do these people think we are doing on our, um, holiday that we have to be told to be safe? Do they think we are driving drunk? Are they worried our stoves might malfunction and perhaps blow up as we prepare our Thanksgiving feast? Maybe they think we are going to eat so much that we malfunction and perhaps blow up. I have no idea. I am mystified. Maybe they are concerned about our shopping. After my urban shopping yesterday I can kind of understand it. I was in Family Dollar when there was this disturbance and these kids went running out and the clerk had to get on the phone and call security. And in K Mart you should have seen all the slugs and schufts talking and swearing into their cell phones. And the boom cars in the parking lot. Howard said: "Well, this is why people live in the suburbs." That was when I was back home and complaining about my urban shopping experience. Well, I have no time today to sit around in Leonard Pennario's bathrobe trying to figure out the opaque modern mindset. First I have to get snow tires on my car, an errand that makes me want to kill myself but Howard says I have to do it and besides he has put the snow tires in the trunk. Second I have to make two kinds of stuffing. Third, clean up the house big time. Fourth -- oh yeah, have to go to work. Already I blew a lot of time listening to Pennario playing Beethoven's "Moonlight" Sonata. Now I really have to fly. Everyone, have a safe Wednesday! This is a picture I snapped lastnight, listening to Viva Vivaldi. It looks like something out of the Renaissance but it is really just First Presbyterian Church. Observe the dark balconies, and the people in them. Note to out-of-towners: This is the kind of place Buffalonians sit around and play music in. We do not even think twice about it. Observe the man in the back pew reading the paper. 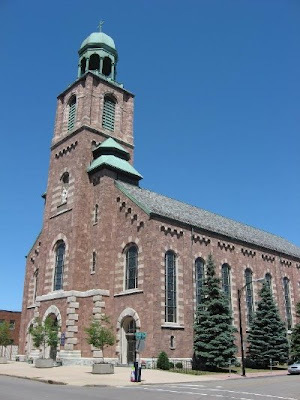 Here in Buffalo we don't just worship and listen to music in our grand churches. We use them just for sitting around. Speaking of which, I should not be sitting around like this today, reflecting on this and that. It being Thanksgiving week -- how is that for grammar? -- I am feeling guilty doing anything but preparing for the family feast. I just put in an hour working on a chapter of my book about when Leonard Pennario was 17 and I feel guilty about that. If I am not making pie crusts and cleaning bathrooms, I am accomplishing nothing. Cooking magazines are bugging me these days. Want to know why? Sure you do. 1.) They are always asking for "best-quality" ingredients. "3 oz. best-quality chocolate," they say. Look, if I want to cheap out and use Shur-Fine, it's my business. 2.) Quit telling me to deep fry my turkey. 3.) What is with this mythical can of orange juice concentrate these recipe authors assume we keep in the freezer to dip into, a tablespoon here, a tablespoon there? For the love of God as my friend Michelle would say. 4.) Quit telling me to brine my turkey. I have brined chickens before and I know it is a good idea but for heaven's sake, this 20-pound turkey, how am I ever going to brine that and fit it into the fridge? 5.) Don't you hate it when the magazines throw 30 ingredients at you and twice as many steps and call it easy? OK, this is not my original gripe. An anonymous commenter posted it last time I went on a cookbook tear. Now, why would someone with that opinion not post his or her name? It reminds me of a conversation I just had when I ran into my friend Ari at Mulligan's Brick Bar. Ari complained: "You never answer me when I comment on your blog." I said: "Ari, I don't remember ever seeing a comment from you!" "Well, I'm anonymous," he said. "Then how am I going to know it's you?" I said. Maybe Ari was the one with the cookbook gripe. But I doubt it. Ari is calm when he cooks. The only thing is, he cannot read a recipe out loud without doing so in the voice of Julia Child. I caught that from him. Once my friend Jane and I were leading a cooking class at the Broadway Market and I was cooking North African Couscous and explaining how I did it and suddenly I was doing what Ari does and talking in the voice of Julia Child! "I'm sorry," I said into the microphone. "My friend Ari, when he cooks, he always imitates Julia Child." Then I just went on doing it! Some things you just cannot turn off. I have this long day ahead of me -- have deadlines at work plus at 6 p.m. 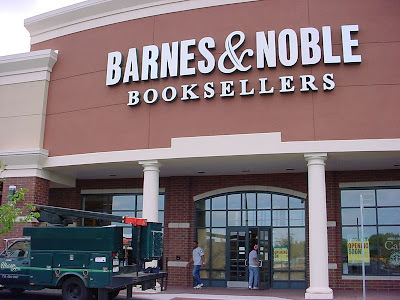 I have to go out to Transit, to Barnes and Noble, to sign copies of my dad's book. I have miles to go before I sleep. And here I am writing about Ari. What in the world. No wonder I am not signing copies of my own book, about Pennario. No wonder I get nothing done. Lastnight I could not sleep, absolutely could not. I was wandering the house in my pajamas, thinking about two things: Leonard Pennario, and the fact that I have to cook the family Thanksgiving. At 4 a.m. I decided I was getting nothing done so I may as well set the table. So I did that. I got out all my Grandma Kunz's Limoges china and arranged all the plates and selected the napkins. Being a woman is great, I have to say that. All it takes is doing something like this and bingo, your mind is off your troubles. I was standing there going, OK, that gold napkin looks nice, but maybe I should switch the gold and the blue napkins... Then I got out all the trays and platters. Then I sat down at the computer and went over a little of Pennario's Capitol sessionography. This is a listing of what he recorded and when. It was like crack cocaine and I could not put it down but finally I just could not focus or see. I said, OK, I'm going back to bed. Now it was 5 a.m. or something. And stupid me, I set the alarm for 7 a.m. I should have set it for 8! Because Mass wasn't till nine. Well, I was so out of it. So there I am, up at 7. And you know what? Two hours' sleep, and I felt great! Here is something weird my sleep doctor told me back when I used to have this insomnia problem a lot. He told me that people used to prescribe sleep deprivation for depression. If you are depressed, you can always go without sleep, and it improves your outlook. For a while, anyway. I would think that after a while it would catch up to you. Today I was high on my lack of sleep and I was going around making friends with everyone. I met this great couple at Viva Vivaldi, at First Presbyterian Church on Symphony Circle. We were in the same pew. They met each other while they were bicycling in Belgium. I could not believe that. I met my husband on a barstool! I told them that and we were laughing and laughing. They live in Tonawanda on this house right on the Erie Canal and they are going to invite me there. They said so, anyway. We shall see. What with all this excitement I almost forgot to say I ran into my friend Ari Silverstein. At the Brick Bar on Allen Street! Ari was in town to hear Mark Murphy. He had a T-shirt that I photographed. That is what you see above. It said to rub his stomach for good luck. Needless to say I rubbed Ari's stomach. That will surely bring me good luck. 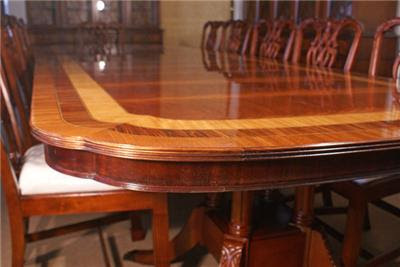 Howard found this table on the Internet. We want it. It is 13 feet long and the only trouble is that it costs $12,000. Darn! It would have been so great to have for Thanksgiving. I am preparing to, ahem, play host to the family Thanksgiving. On Tuesday I have to go pick up my turkey at Malczewski's. Remind me, someone! Jim Malczewski wants me there on Tuesday and not Wednesday. If I go there today he will remind me because he knows that the only thing I can focus on is Leonard Pennario. Wow, have we ever checked out that Pennario performance before? I don't think so. What a stunner! He is out of his mind! He makes all the other pianists sound like little girls. I am going to put that on the back cover of my book. Thanksgiving is a great meal to cook because the menu is virtually decreed and it is all easy to cook. The turkey is bulky but that is the only problem. Pie crusts can be made in advance and pies are pretty foolproof. You do not need them to rise or come out of a pan clean or anything. If Thanksgiving involved a Bundt cake, I would be in trouble. Why I can learn Chopin's "Winter Wind" etude but not get a cake out of a Bundt pan, I will never know, but that is the way I am. Oh well. My friend Dawn at work told me something that stuck in my head. "Mary, it's good that you stink at something," she said. "It builds character." That was after an office kickball game last year when I had started running from second base when I should not have, and hence had struck out -- Loser! -- and was complaining about it later as we drank beer at the Rose Garden. Anyway, about Thanksgiving. The problem is not the cooking. The problem is the house. My house is crammed with junk. I really should just pull a Dumpster out front. Isn't it funny how you have to capitalize Dumpster? Everyone writes "brussels sprouts" and "french fries" but boy, that Dumpster, it's dignified with a big D.
Yesterday after work I started in on the sun room. That is a disaster area because back when we had that flood, this is where I dumped everything. Now it was time to put it all back where it belonged. At least I got to listen to my new hi-fi while I did it. One of the records it came with was the highlights from my favorite opera, "The Marriage of Figaro," with Elisabeth Schwarzkopf as the Countess and George London as the Count and Erich Kunz as Figaro. Remember Erich Kunz? We talked about him a few days ago. To take everyone's mind off my clutter, here is an aria I love from "Figaro." It is supposed to be seductive -- Susannah is singing it to lure the Count to the garden -- and Mozart could make music seductive as no one else could, if you ask me. That part about "I will wreath your brow with roses." The music there. To die for, if you excuse me for using a slug phrase. Great, I just sat and watched that video through three times. First Pennario's Liszt and now this! My Saturday is really off to a running start. And I thought that encounter at the buffet was weird. Wait till you hear what happened to me yesterday. This is Wednesday we are talking about. Yesterday I did what I have never done and I called a number in The Buffalo News' Thrifties column. There was a Magnavox record player for sale. My record player kicked a couple of weeks ago and going without it is like going without oxygen. I mean, I talked a good game the other day about playing "Song Without End: The Fabulous Life, Loves and Music of Franz Liszt," but the truth was, I wasn't actually able to play it. I wind up driving all the way out to the deepest recesses of Tonawanda, out by the 290, where I never go. I got lost once and had to pull into the Delaware Plaza parking lot and call Howard. He had to use GPS technology to get me back on track. Finally I get to this little ranch house on this dark little street. This woman answers the door -- I never did get her name. Her little grandson and this great little white dog come running up. I pet the kid and the dog and then all of us go back to the back porch, where this stereo was. I forgot to mention the ad said the stereo came with 130 records. The price was $50 for everything, stereo plus LPs. "My husband bought this estate," the woman was explaining. "He picks up all kinds of stuff. These records aren't our kind of music," she shrugged. "But I'll let you hear what this sounds like." It was unheated on the porch and you could see everyone's breath. There was a record on the stereo's turntable and it made me smile that it was a Capitol record. Capitol records have been on my mind so much these days because Leonard Pennario was a Capitol artist. The woman puts the needle on the record. And this beautiful, nostalgic music filled the room. Chopin's D flat waltz. "Wow, this is a funny coincidence!" I think that is what I said. "I am writing a book about this pianist. He is ... He was my friend," I said. I am sure she thought I was nuts. She had no interest in hearing about Pennario. (Imagine that!) Neither did her husband, who showed up after a few minutes. They wanted to talk about other things. One thing they mentioned was their church. They go to St. Timothy's. This is a Catholic radar signal -- it was my cue to confirm that I was Catholic by mentioning my parish, and from there, we would segue into what priests we both knew, etc. And normally I love talking about the Catholic church. But I was so floored by the Pennario coincidence that I missed my cue totally. I could have been Methodist for all she knew! I was just standing there staring. Then they told me about the people who had owned the stereo and the records. But that is a very strange and romantic story for another day. I did have the presence of mind to appreciate the scene: me, this woman, her husband, the kid and the dog, all standing there with steam coming out of our mouths, listening to Pennario play one waltz, then another. "This isn't my style. I like cowboy music," the husband confessed. But the little boy seemed fascinated by the stereo and absorbed in Pennario's artistry. Well, sorry, kid, you're doomed to a life of dull pop music. Because, needless to say, I left with that stereo, and Pennario's Chopin waltzes, and the rest of the records. Years from now this little boy will be dealing with this traumatic memory on some analyst's couch. He will realize how deprived he was. That is a picture up above of my new stereo. Here is another view. Observe the Capitol label. The stereo has a beautiful warm sound. And when Howard saw it he complimented me on my good taste. "It is so cool," he said. "Look at its legs. It's like out of the Sputnik era." Plus, among the records I got with the stereo was Pennario's "Rhapsody Under the Stars," which I didn't have! I can't wait to play it tonight. I can't sleep so I am blogging in the middle of the night. And I was rewarded for being up at all hours! There was this email waiting for me from this gentleman I emailed earlier today, about Capitol Records. Leonard Pennario was a Capitol artist all through the 1950s when he made an amazing 40 albums on the label. That averages out to four a year! 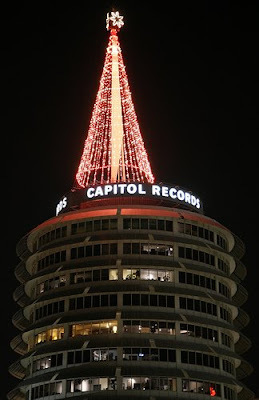 Anyway, this morning, up before dawn, I was looking around on the Internet for info on Capitol, and I found this blog, all about Capitol Records. I found some stuff out on this blog that I didn't know, including that Pennario had tossed off Moussorgsky's "Pictures at an Exhibition" all in one session (that's my boy) and that he had recorded Bach's Toccata and Fugue in D minor. Now that I would like to hear! And I wonder why I can't sleep despite drinking two glasses of wine. Anyway, I emailed the guy who did this blog asking about people I could get in touch with at Capitol. And just now, I see he got back to me with all kinds of useful information. Which is great! Why do my own research when I can get someone else to do it for me? And here is what kills me: he is from Eggertsville! He lives in California now but is thinking about moving back soon. He is a graphic designer. Anyone out there with any job leads for this gentleman? He is my friend now. His name is Mark Heimback-Nielsen. His blog is here. I am warning you: I have a little problem with calling it up on the computer. It must be overloaded with information about Leonard Pennario. What's this question I am picking up? Someone is asking me something. I hear it now, it being the middle of the night and dead quiet: "What else is new, Mary, on the Leonard Pennario front?" Such a nice question to be asked! 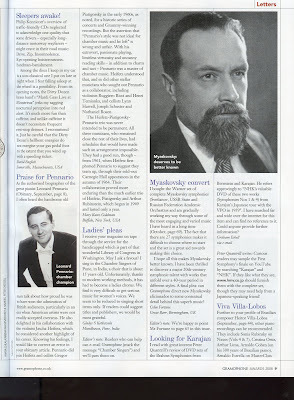 I spoke with Leigh Munro, the soprano. Hearing what she had to say brought tears to my eyes. She said that whenever Pennario came to hear her sing, he would send yellow roses to her dressing room, a dozen yellow roses. He would take her out to dinner and they would walk on the beach. I'm so jealous! What made me tear up was listening to her tell of the last time she saw him. The story was so romantic and sad. I will have to call more women for my book. Women have the best stories. I am going to go into Pennario's address book and call every woman in it. It will take me a long time but it will be worth it. Now we segue to the subject of Peter Piccolo. Remember Peter Piccolo? We discussed him last month. 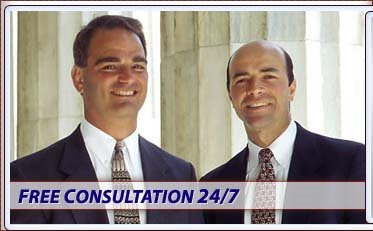 Since then, the Pennario blog has become the clearinghouse for information about Peter Piccolo. Several people were good enough to comment, providing details on his death. Last week I got a phone call last from Mr. Piccolo's great-niece and today we actually spoke. She is looking for information on her great-uncle's murder. I also got a comment just yesterday, from her mom. It is funny, talking to people who know you from your blog. You find yourself talking as if you are not strangers. Welcome, family of Peter Piccolo, to the Pennario Web site. You might enjoy this. As the Capitol Records expert from Eggertsville proves, the world is getting smaller by the day. Good morning! Happy Monday! How was everyone's weekend? One highlight of my weekend was that on Saturday I went to the Salvation Army with my mom. The atmosphere was really obnoxious with the sound system blasting static-filled Bon Jovi, but hey, I knew I wasn't at Lord and Taylor. And here is the good news: I scored a great dress which I was able to wear that very night to go hear Jackie Jocko. Jocko told me into the microphone in front of everyone: "That dress fits your body perfectly." Thank you, Jocko! Thank you, Salvation Army! Also, while my mom wasn't looking I was able to scope out the records department. My mother always yells at me for buying records because I have so many already and I know it's stupid, but she has actually prevented me from buying a few things that now I wish I had bought. Saturday, I slipped from her grasp and somehow I even managed to check out my purchases without her seeing. Here is a picture of my mother. 1. Two LPs of "Erich Kunz Sings German University Songs." Besides having my name, Kunz was a great baritone -- his version of "The Merry Widow" with Elisabeth Schwarzkopf was considered the definitive. He was also a great Beckmesser in "Die Meistersinger." He belts these drinking songs and they're a riot. We had records of them when I was a kid. This was the kind of household I grew up in and why I turned out the way I did. Wow, check out that You Tube link! Can't beat those graphics. 2. A Vox box set of Ambrosian Chants, sung by the Choir of the Polifonica Ambrosiana. The priest at my church, Father Secondo, is from Milan and he has told me that he would like to do Ambrosian chant at the Latin Mass I go to. Now, when he does that, I will be ready! 3. I saved the best for last. I found the soundtrack to "Song Without End: The Fabulous Life, Loves and Music of Franz Liszt." For 99 cents! This is a foldout album with pictures and everything. I am poring over it right now. Dirk Bogarde played Liszt. Genevieve Page plays Marie, who I am assuming is the Countess Marie d'Agoult. One of the pictures is captioned: "Liszt finds he is bored with Marie." This is great! I will have to see this movie. Jorge Bolet plays the piano. I wish Leonard Pennario was around so I could tell him about this find and we could laugh about it. Incidentally I have yet to find a Pennario album at a thrift shop! I used to tell Pennario that and we would gloat together about it. Howard says that Pennario albums are heirlooms and people do not throw them out. I think that is right. Of course, if I found one, I would happily grab it. I had a good weekend for music. Not only did I hear Jocko but I got to go out with my friend Michelle on Friday night and hear Beethoven's "Harp" Quartet. I love the slow movement of that quartet and looked forward to hearing it so much that I even dreamed about it the night before! Ate falafel before that at Byblos, washed down with a glass of box red wine. Life is good! Today is the day I interview the soprano Leigh Munro about Pennario. They were very good friends and went all kinds of places together. Miss Munro is known for her starring roles at the New York City Opera and she also sang extensively on Broadway, including in "Phantom" (I believe she played the witchy soprano, not Christine). I got a little sick of hearing from Pennario all about how great looking she is but I am looking forward to talking to her just the same. What better way to begin it than by listening to this? Today I came home from church and took this picture of my garden. It is a miracle I have not gotten a ticket or a summons or something. Well, in Buffalo anything is allowed. Undoubtedly I am being talked about at block club meetings. Well, at least my loser garden keeps me from getting upset at the neighbors who love to park cars on their lawns, Erie County Fair-style, even though we have parking up and down the street and a lot of the time the space right in front of their house is vacant. Before, that used to irritate me. Now I simply look at my "garden" and think: Who am I to talk? I am going to put "garden" in quotes from now on the way Leonard Pennario did when he was being sarcastic. Here is a funny story about non-gardening and it is true. I went to Fredonia for a some concert or other a few years ago and afterward, having dinner with whoever I was with, I overheard this conversation between two women at the next table. Woman A: "How is your garden doing?" Woman B: "Forget it. It's not. I don't have time to garden. I play the piano. That's what I do. I do not garden." Honest, I heard that. I went and told my piano teacher, Stephen, about it. Wow, this is the second time in three days I have mentioned Stephen! I don't know what is going on here. Anyway, he said, "Who was she?" Because this being Buffalo he figured he probably knew her. Alas, I didn't think to ask. I have often regretted that. Because I love those two sentences: "I play the piano. That's what I do." So unapologetic. So inspiring. I will adapt it to myself. "I don't have time to garden. I write about Leonard Pennario. That's what I do." If anyone tries to get me about my "garden" that is what I will say. Hope is in the air now and I do not mean in terms of Barack H. Obama having become elected. I am talking in terms of the snowflakes in the air. I just saw a handful of them outside the window. I cannot wait until the snow buries my "garden." The Leonard Pennario biography blog made the big time yesterday, featured on Access Niagara. 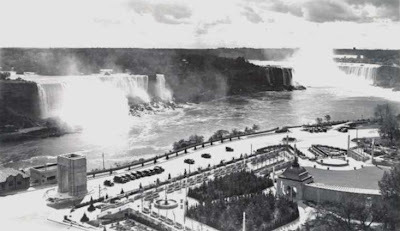 Brittle Canadians read of my experiences traveling to Niagara Falls, Ont., to meet with Pennario's decorator. They posted a few of my comments. And there was much kvetching. Catch the controversy here. One thing I like, for once no one attacked me personally. They were just defending Niagara Falls, Ont. They love Clifton Hill! Isn't that interesting? 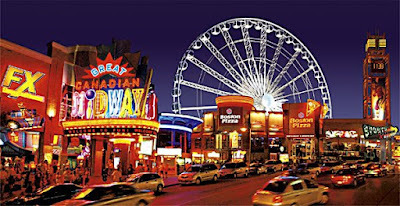 I put that picture of Clifton Hill up above just so we can all chew on that. Kind of pretty, isn't it? When I was little some of that was left. One thing I remember is Oakes Gardens. You entered it through a beautiful gate and I thought it was the most magical place in the world. There is a bit of Oakes Gardens left, squeezed in next to the Hard Rock Cafe. But when you walk through it you hear this rock and hip-hop pounding at you. Speaking of what used to be where, Howard and I have been researching our former neighbors on the Delaware Avenue block off Niagara Square where sits Big Blue. Across the street from us used to live Dr. Ray Pierce. 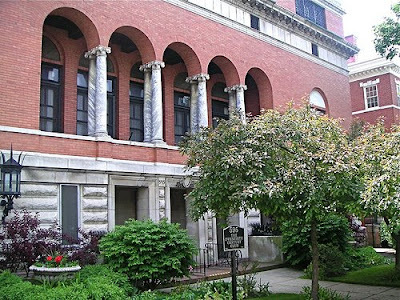 He is described in Father Dunn's great gossipy book "Delaware Avenue Mansions and Families" as "a famous charlatan." But when I compare his offerings with what I see at modern-day health food stores it just looks as if Dr. Pierce was an herbalist. I'm just saying. The stuff he sold is like what I see in drugstores now. Though I cannot say I have seen anything with as witty a name as "Dr. Pierce's Pleasant Pellets." 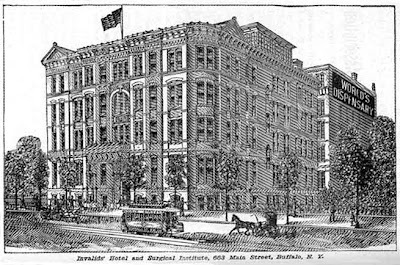 Dr. Pierce besides living across Delaware Avenue from Big Blue had the famous Dr. Pierce's Invalid Hotel where D'Youville College is now. Leonard Pennario used to practice at D'Youville College when he was in town. Note to out-of-towners: D'Youville is a Catholic college specializing in nursing. My Uncle Bob was a professor of philosophy there. Now it is co-ed but in Pennario's time it was all girls. No wonder it was popular with itinerant Catholic concert pianists. This picture comes to us -- I am not kidding -- courtesy of the Museum of Menstruation. Who ever knew there was such a thing? Maybe it is on Clifton Hill. Oh, wait. On second investigation, the museum appears to exist only online. You can access it here. It is a kind of scrambled Web site but the bright side is, it appears to be obsessed with Dr. Pierce, the way I am obsessed with Leonard Pennario. Worth a look, I say. Howard found a leaflet called "Pierce's Memorandum and Account Book." Every page has a different month and a different heading. The booklet is for the year 1907-1908. January says: "WHAT IS DOTTED DOWN HERE WILL BE USEFUL IN AFTER YEARS." For May: "HOW OFTEN WOULD I BE MISTAKEN WERE IT NOT FOR MEMORANDA IN THIS BOOK." June: "THIS BOOK WILL SAVE THE LABOR OF LOOKING UP DATES." September: "ALL CONTRACTS MADE BY ME ARE REFERRED TO IN THIS BOOK." Fully Restored by Dr. Pierce's Medicines. Hmmm, sounds like me in Pilates class yesterday! What a weakling I was! The teacher, Jim, had to walk over to my mat and poke at me to make sure I was still alive. The intact bottle of Dr. Pierce's Smart-Weed at Big Blue. Please click image to read label. Howard found an unopened bottle of Dr. Pierce's Smart-Weed (a brand name I love) and surely the Pleasant Pellets will be next. They exist out there somewhere. We will find them. Next time I have to go to Niagara Falls, Ont., I will make sure to take a few along. Today the Leonard Pennario blog takes a break to say Happy Birthday to Prince Charles. Or, more appropriately, "For He's a Jolly Good Fellow." Isn't that what they sing in England? Prince Charles turns 60 today. I feel sorry for Prince Charles. He has always been such a big, slow target. Everyone liked Diana because she looked good on TV, and Charles inevitably suffered in comparison. When I was about 22 I spent about three months in England and noticed right away that he had a nonstop public relations problem. He had just given a speech to a convention of lumberjacks in some God-forsaken corner of Britain. He had said something about the beauty of nature. And the tabloids were all having at him. "Charles Talks Philosophy to Lumberjacks," the headlines screamed. I'm thinking, come on! All the guy did was say was that the countryside looked beautiful, he felt in the presence of God, something like that. But if the media are going to kill someone, they are going to kill him. We have certainly seen that in this country. By the way, I wonder if it is stretching things to say that Charles is chafing to be on the throne. Isn't that a lot to assume? I think he might be just as happy to stay the Prince of Wales the rest of his life. There is a comfort in that, in not being in the driver's seat. Charles' wife, Camilla, is throwing a party for him featuring Rod Stewart. That bugs me for two reasons: One, I was not invited. Those great, dirty Rod Stewart ballads! And two, I always thought Charles liked the kind of music I did. Remember how he used to drag Diana, who would be kvetching and moaning, to Covent Garden? So though I have a soft spot for old Rod Stewart, I am disappointed Charles did not ask for a fine pianist instead. Who do they have over in England? Alfred Brendel -- doesn't he live there? Stephen Hough. No one on the level of Leonard Pennario but ... oh, wait. Maybe I have it figured out. It must be that, Pennario being unavailable, Charles decided to pitch the piano idea and settle for rock instead. I wonder what it is like for Camilla. That is a situation that has always fascinated me. 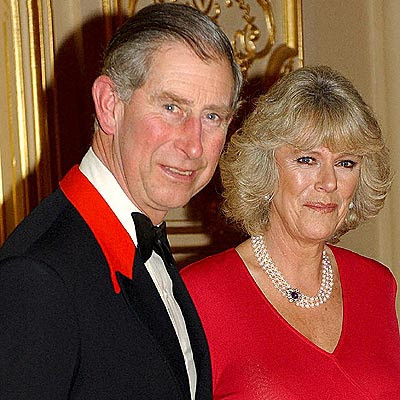 Charles and Camilla fell in love when they were teenagers but for some byzantine reason they couldn't marry each other. My piano teacher, Stephen, he told me it was because Camilla was not a virgin. Stephen is wise and knows all kinds of things that I do not. What a story that is, when you think about it! In a way it is even more dramatic than Edward and Mrs. Simpson. If you ask me it deserves better than Rod Stewart's "Tonight's The Night." Yesterday I was going for a walk at lunchtime with my friend Melinda and we got to the Main Place Mall and lo, we beheld Gino and Joe's. "Look, there's one business in the mall that isn't failing," I said. "Gino and Joe's, making us fat for over 20 years." With which both of us knew what had to be done. We had to get a piece of pizza at Gino and Joe's. We just had to! And it was wonderful. Crispy crust, piled with peppers and chicken. Gino and Joe's could make even that weird variety taste good. Plus the guy behind the counter gave us an extra piece of normal cheese pizza, free, to split. "It's on the house," he said. He growled that -- you would think if someone is giving you a freebie he would do it with a smile. But so what? It tasted good anyway. But wow, an hour and a half later I regretted eating that pizza. I was knocked out! Honest, I was sitting at my desk in a coma. I am always more or less on the South Beach Diet and it has taught me to avoid white bread and white pasta. I don't think about it much -- I just automatically cook with brown rice and whole wheat pasta. But when you eat that white pasta or white bread, you feel it. I can not do that again! And I was enjoying the story I was working on, too. It is about this metal band, the Trans-Siberian Orchestra. (Warning: Turn your speaker down before clicking that link.) They are playing Christmas shows at huge arenas around the country. I talked to two band members and they are so wacky and sincere, I am getting such a kick out of writing about them. One guy I talked to is Robert Kinkel, the keyboard player. He was inducted into the Buffalo Music Hall of Fame last year along with Leonard Pennario. Kinkel did not make it to the ceremony. Too black bad for him! Because that was the night I met Pennario. If Kinkel had shown up, who knows, I might have written a book about him! That could have been Kinkel and not Pennario I sat around with late that night, listening to Jackie Jocko. Kinkel's picture, and not Pennario's, might have appeared at the top of this blog entry. That could have been Kinkel's decorator I was visiting yesterday, not Pennario's! Well, I am glad things turned out the way they did. Time now to run out into the rain. Yesterday, following in the footsteps of Peter Ilyich Tchaikovsky and Gustav and Alma Mahler, I made my way to Niagara Falls. My mission: to interview Leonard Pennario's decorator, Phil, who is participating in a bridge tournament there. It was an adventure from the start -- I mean, right from when I crossed over the Peace Bridge after work. I have a little game I play at Customs, I have to confess this. I like to be able to mention Leonard Pennario. It is cheating to volunteer his name outright. The idea is to goad the inspector into asking: "Who are you writing your book about?" Then I get to say "Leonard Pennario." And I have won! You know that sound you hear when you are walking through the Niagara Casino and hear quarters pouring in a torrent into someone's cup? That is how I feel when an inspector at customs asks me who I am writing my book about. So. There I am, 4:30 p.m., at the Peace Bridge's spanking new toll plaza which, by the way, I have never seen before. I pull up to the booth and there's a woman in it. Good! Women are more fussy and they quiz you to death which means there is a greater chance I will get to mention Pennario. And this woman did quiz me to death. She looked at my driver's license. Then back to me. At my license. At me. She asked what I was doing in Canada. I said I was working on a book and had to interview someone who was visiting the Falls for a bridge tournament. I could have just said I was visiting a friend. But I was afraid if I did that she would just wave me on through and my chances of mentioning Pennario would be nil. As it was, I chose wisely, because we ended up in this convoluted conversation with her asking me if I was paying Phil for the interview, or if he was paying me, and me saying no one was paying anyone, and she asked where I work, and I told her. She frowned. Things were looking good! And then she asked: "What is your book about?" I could have said Pennario's name then. But I wanted to up the bar, make things more challenging for myself. "A great concert pianist," I said. She did not ask who it was. No one ever does. But she kept on quizzing me, about whether I knew anyone in Canada, who this guy was I was meeting, why he was here, etc. Until finally I said: "The pianist I am writing about is Leonard Pennario. He died, this is one of his friends, and I am talking to him about Leonard Pennario." I said it twice!! I wanted to reward myself after all my fine strategizing. I smiled about that all the way down the QEW. Meeting Phil was fun although our conversation turned out to be not in the august surroundings I pictured yesterday. We just talked in Phil's room. He had everything ready -- all his notes and, to my delight, cute 8-oz ice-cold bottles of Coke. God, I love real Coke. Actual Coke, with sugar. I don't know when the last time was I had one. It was more fun than drinking wine and coming from me that is saying quite a bit. Phil's room was not only not Marilyn Monroe's room, it was not even at the Brock. The bridge tournament was at the Brock. He was staying at the Skyline Inn. Which was really weird! It took me a million years to find his room. There are these indoor courtyards you have to walk through and this opaque number system. I was not the only one lost. There was this guy who was lost too. Here is a picture I took while I was lost. And here is a picture of Phil. He was terrific and very erudite and we did a lot of talking about Pennario's life and career. Also the lives and careers of a few other pianists. Phil was also a good friend of Liberace's. Leonard did not like Liberace. That is my coat and hat on the bed. Observe the two bottles of Coke visible to the right. I looked forward to my customs adventure on the way home. And I was not disappointed. Actually I was pretty lucky, I see that now. Howard tells me you need this new document to cross the Peace Bridge. I did not have that. Also, my passport had just expired. All I had was my driver's license. I do have a passport that has not expired, but it was Pennario's. I should have handed them that! That would have gotten the conversation around to Pennario pretty quickly. The guy at the Peace Bridge on the way home did what the previous inspector had done. He looked at my license. Looked at me. Then he asked for another photo ID. I gave him my work I.D. He stared some more. Asked some questions. Finally he said, "The reason I'm asking is, you have braces. And the person in this picture" -- he showed the license -- "has perfect, straight teeth." "You're kidding," I said. I didn't know what to say. The thing is, that picture was taken by Jocko's friend Electra, who used to take the pictures at the Northtown Auto Bureau. Electra is like the Annie Leibowitz of driver's license picture takers. She makes you look great. This is the best picture I have ever had taken of myself and it is on my driver's license. Unfortunately Electra retired. When I get my picture taken next year it will be back to the real world. The customs inspector went back and forth about my teeth and my braces. I told him I got the braces in March, etc. I said people used to mock out my teeth when they wanted to be mean to me. I can't believe I told him that but I wanted to tell the truth. He said he was going to have to pull me over. "That's fine," I said brightly. Being pulled over meant that surely I would be able to mention Leonard Pennario. Perhaps if they detained me a while I could discuss him in depth! "I like the increased security," I said. Which was a tactical error. Because I wound up not being pulled over after all. The inspector said he was just gauging my reaction. By the time I left that booth we were joking together about how Barack Obama is going to raise our taxes. And there had been no opportunity for me to mention Leonard Pennario. I lost that round. Next time I will know better. When they say they are pulling me over, I will gripe! 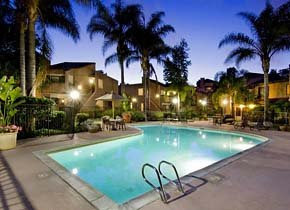 It was good to hear from Mike in San Diego on yesterday's blog. Mike, please do not be offended by my comments on Unitarians! I kid around a lot. The Steinway family, who made the pianos, they were Unitarian. I love my Steinway! It is just that I did have that friend who became a U.U. minister and he did tell me that, about Jesus Christ and the podium. I had to write that. I just had to. Today is an exciting day. 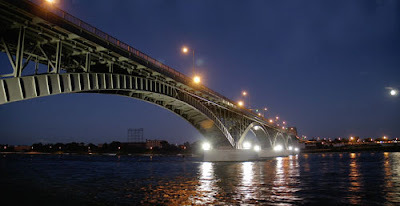 Today is the day I journey to Niagara Falls, Ont., to meet Leonard Pennario's friend Phil who is participating in a bridge tournament and has agreed to meet me before his 7 p.m. round. How I am going to do this in addition to working and getting only three hours' sleep I am not exactly sure. But it will work out. Everything about my book on Pennario works out. This book is meant to be so everything had just better get out of the way. When Phil called me lastnight he left a message and he said: "Is this the nut in the bathrobe?" I like that about him. I also like that he has agreed that when we meet I can get someone to take our picture for the blog. Thank you, Phil! This will be a rare opportunity for me to check out Niagara Falls, Ont. I do not know the last time I have been there! I hear they have a building now that dwarfs our HSBC Center. Either that or it is in the planning stages. I wonder how many hotels and casinos they have now. Then there will be tacky old Clifton Hill with its funhouses and video arcades. Thanks a lot, Canadians, for messing up our view! Whenever I look at Niagara Falls, Ont., that is what I always think. I think we should louse up their view, too. We have been too nice to them with our parks and green space. It is good that with our casino with its big light-up feather, we are catching up. Wow, I hate to imagine someone unfamiliar with both Niagara Fallses stumbling on this. Funhouses?? they must be thinking. Light-up feather? How do these things serve to spotlight one of the Wonders of the World? Maybe we could put up big Golden Arches over the falls. Or get back "Green Lightning." Remember "Green Lightning," that "sculpture" that Mayor Jimmy Griffin had taken down a long time ago? Finally, the perfect place for it! OK, I am being mean. If I were a Unitarian I would not be talking like this. One thing nice about Niagara Falls, though, is something my brother George told me: that many of the things you see in the movie "Niagara," with Marilyn Monroe and Joseph Cotten, are still there. Pennario was good friends with Joseph Cotten and even better friends with Cotten's wife, Lenore. I think George said the tourist cabins you see in "Niagara," where Joseph and Marilyn stay, are still around. And of course the Cave of the Winds is not that much different from the way it was over 100 years ago when Tchaikovsky visited. Tchaikovsky did the Cave of the Winds. Think of that this year when you watch "Nutcracker." 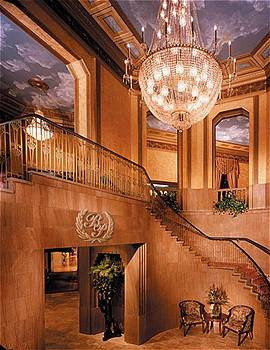 I am meeting Phil at the august Brock Plaza Hotel, one of the few vestiges of the old Niagara Falls, Ont. That is the hotel pictured above. I imagine us discussing Leonard Pennario in those chairs visible at the lower right. An almost-as-exciting thought: Somewhere on the Internet I read that Marilyn Monroe stayed in room 801. I wonder if Phil will get that room! He might, if he drops Pennario's name. Lastnight I went to Viva Vivaldi and afterwards three of us made a beeline across the street to Cecilia's for a glass of that dandy Montepulciano. St. Cecilia being the patron saint of music, that is the least we can do. The Viva Vivaldi concert was at the Unitarian Universalist Church at Elmwood and Ferry, pictured above. My sin for today is envy. I envy the Unitarians this church. All through the Geminiani concerto that began the concert I was looking up at the rafters, the way I always do when I go to concerts here. Well, I went to one wedding in this church too. 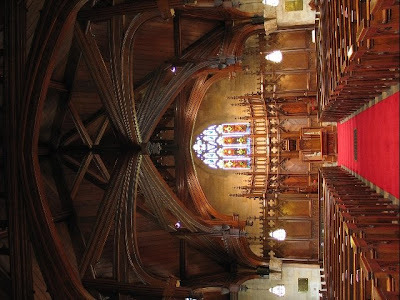 And a few years ago I went to a Sunday service, to catch the visiting minister's act. I knew this guy from when we were in our 20s and used to get together to drink copious amounts. Once this guy fell asleep in a fire pit. I am not kidding. There were hot coals in there at the time, too. Now here he was a U.U. minister. So we went to hear him preach and then went out to eat. Back to this church and my sin of envy. Yesterday my sin was sloth. I guess you could call it that. Tomorrow's might be gluttony. No shortage of sins here! I covet the Unitarian Universalist Church on Elmwood. I do. I covet its stone walls and its high arched wooden beams and in the summer when I come here for Chamber Music on Elmwood concerts, I covet its gardens. The U.U. was designed by Edward Austen Kent, who went down on the Titanic in 1912. They have a plaque to him in the church. It is made out of Indiana limestone, like St. Gerard's. It has these exquisite teardrop-shaped chandeliers. I know this church was built to be a U.U. church but they do not actually believe in anything so I believe it is wasted on them. My U.U. minister friend told me that the only time a Unitarian minister says "Jesus Christ" is when he trips on his way up to the podium. I am serious. That is what he told me. 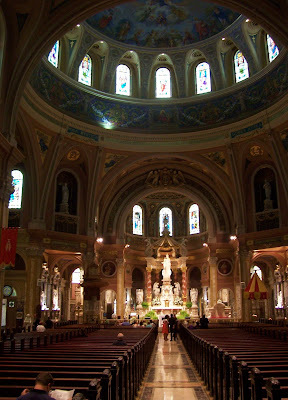 Which is one reason I was sitting there lastnight in my padded pew thinking: This should be a Catholic church! We should buy it, I thought. We could make the U.U. 's an offer they couldn't refuse. Maybe we could give them St. Gregory the Huge in exchange. I didn't really make that up, by the way, "St. Gregory the Huge." I got that from this priest I met once. These priests you meet, they are the funniest people in the world. The windows don't depict saints, but we could make up for that by filling the inside of the church with statues of saints, and then you've got the Infant of Prague, the Black Madonna, all kinds of other things that could be added. And should. This church looks kind of barren. That is my only criticism. Then I thought: The Catholic Church doesn't have a presence in the Elmwood Village. Acquiring the U.U. Church would fix that. Now we were well on our way to another sin, Pride. I am unstoppable these days! But here is what is amazing: At intermission I ran into Bill, a friend of mine from the Latin Mass. I do not think it is the same Bill who wrote that Obama has Leonard Pennario on his iPod. But you never know! I should have asked. Bill said: "Look at the front of this church. It would be just perfect for what we do at St. Anthony's." So the question now is: When we acquire the U.U. Church, what do we name it? I would think St. Joseph, the patron saint of carpentry, buying and selling houses, and real estate. But we already have so many St. Josephs. How about St. Barbara, the patron saint of architects and stonemasons? See, now we're all set. Here is the load of vegetables I picked up yesterday on Woodbridge Avenue. As you can see the situation is hopeless. Do not fail to notice the Leonard Pennario album in the background! I laughed out loud when I saw it there. This morning with all this on my mind I was a total minus at Mass. First I got there late because I couldn't find my keys. I got there at the Introit. That never happens, that I am late! I was so mad. Then I could not focus. Just could not. I had made the mistake when I got up of working on my Pennario sales pitch package for a couple of hours. I am getting a kick out of this pitch, which I am going to use to get myself a six figure advance. I like working on it. So when the alarm went off I jumped out of bed feeling as if it were Christmas, because I had two hours to work on it before going to church. Hereafter I will have this rule that I cannot work on the book before Mass on Sunday. It turns me into a vegetable. Did I hear the word vegetable? I should not even be uttering that word. The Mass goes really fast so you have to be on the ball and I was not. The Pater Noster passed without my realizing it. A few weeks ago I lost my place in the Liturgical Year and I do not think I will be able to find it again until Advent starts, whenever that is. So I did not know where we were in the missal. I think I had one coherent thought during the whole Mass and that was when I looked up and admired this one woman's outfit. Duh. La la la la la. There is one line made for me. It is: "Domine, non sum dignus, ut intres sub tectum meum, sed tantum dic verbo, et sanabitur anima mea." You don't have to wade through the whole thing. All that matters is it starts: "Lord, I am not worthy, that you should come under my roof --"
No wonder I know that line by heart. I did not even have to copy it from my missal. Speaking of things under the roof, Howard has a new humidor. It is a Jewett humidor. Howard is in love with all things Jewett. At Big Blue we have a Jewett ice box. The miracle is not that he found this Jewett humidor but that he was able to clear a space in our office to put it. In the process he found a wedding present we had forgotten to open, also an unopened card. This is the land of the lost. Now the humidor sits on a dresser, between last year's phone book and a 1970s pole lamp. Perhaps I will post a picture tomorrow. That on top of today's picture would be just too frightening. 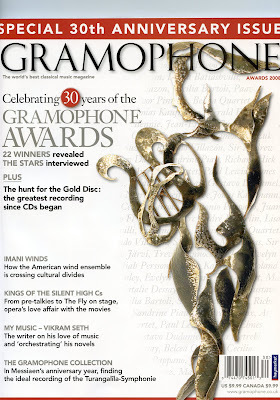 We interrupt this blog because I have finally gotten my copy of Gramophone Magazine. This is the issue wherein the editors graciously print my letter about Leonard Pennario. It is the Special Anniversary Issue, too. Nothing but the best for me! I am very proud to have been permitted to defend the old man's honor. Click on the page and you will be able to read what I wrote. Please take the time to admire my first sentence! It is very graceful if I may say so myself, which I may because no one is going to stop me this being my blog. I still think they should have run Pennario's picture big and that Russian guy's picture small. They would sell more magazines that way! But I think I will quit while I am ahead and not bicker with these people any more than I already have. OK, enough crowing. Back to work! BAD girl! NO Clinton-Bailey Market! I am posting the unflattering picture above so I will stay away. I do not know what that business means about a half mile from home, by the way. The Clinton-Bailey Market is more than a half mile from my home THANK GOD. My kitchen is starting to look like Wegmans! Lastnight I managed to make it through a big bunch of broccoli, with salmon which I am more master of than I am of steak, I will say that after yesterday's experience. Anyway this is what I still have left: six green peppers, two red peppers, seven leeks, two rutabagas, eight beets, six turnips, one Savoy cabbage and three red cabbages. Today I resolve to keep a distance of at least a mile between me and any farmers' market. I am running up the red flag. Luckily my appetite is up again. It has survived the elections. Of course it is one of the wonders of the world, my ability to eat. My mother made me feel better. She had voted for McCain but when we had our steak dinner the other night she was all bouncy and chipper. She had stayed up to watch the election results and had been impressed by the grace of both McCain's and Obama's speeches and had decided they were both fine gentlemen. Plus she approved of how Obama had been married only once, whereas McCain was on his second wife. That is the way my German Catholic mother looks at life and it can be comforting. Another thing that makes me feel better is Howard says that Rush Limbaugh has been replaying Rev. Jeremiah Wright saying: "God D-- America!" I do not use bad words in my blog. Rush said: "Come on, just because the elections are over doesn't mean we have to stop playing that!" That got me laughing. What else got me laughing? This video from the Onion that my friend Steve Sherman sent me. As Howard said, the Onion has sure gotten slick. And Bill's comment about Obama having Leonard Pennario on his iPod. Well, I think I already wrote that. Anyway, my stomach has regained its equilibrium, which is certainly good news for farmers' markets throughout Western New York. Now we can return to other important matters. Like Leonard Pennario. And the weather! How about this weather? I wore sandals and summer clothes to work yesterday. And I still was too warm walking back from Pilates class! Here is what I think is funny. You get a sunny summery day like yesterday. What was it, 80 degrees? And you still see all kinds of people in down jackets and black tights and long wool coats. Honest, I kept passing people on the sidewalk wearing this stuff. Are these people awake? Do they notice what kind of day it is out? Perhaps they awaken with their brain computing, robot-like: "It is November. I live in Buffalo. Hence I will wear a down jacket." Maybe they are not real people. Maybe they are those people Mason Winfield told me about that if you watch them long enough you will see them disappear. Or maybe they are the people who voted for Obama. OK, I will stop now. No more election coverage on this site. I do not want to put myself off my feed again. I can't afford to. Not with all the stuff in my kitchen. We have not talked for a while about Howard and steak. It is time to revisit this subplot in my life. Lastnight I was cooking dinner for my mom so I ran to Budwey's first and I got sirloin steak. My mom loves beef. I did up the beef according to a recipe in Martha Stewart Everyday Food, with red wine sauce. The recipe was actually for something called Flat Iron Steak but that is one of those mythical cuts magazines refer to that you cannot actually find anywhere. Like skirt steak and flank steak. Has anyone out there ever seen those in your life? Well, steaks are pretty much steaks and I was careful with this sirloin. And it turned out beautifully. And there was much rejoicing. Then I got home and I had saved a third of the steak for Howard so I cooked it up for him. Rare, the way he likes it. But I forgot, I cannot cook steaks for Howard! First he asked me where I got it. "Budwey's," I said. Then he tried to be nice about it. "I can see that preparation went into this," he said. "I can't imagine anyone else putting this kind of preparation into a supermarket steak." I cooked dinner for Leonard Pennario once in California. I made him pot roast. Pennario praised me half to death. You should have seen the look on his face. 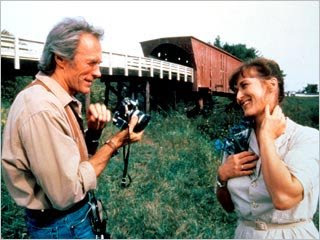 Totally like Clint Eastwood in "The Bridges of Madison County," when Meryl Streep makes him that home-cooked meal. I loved that look. That is the kind of look I want from Howard! I guess I will have to go find where the Chophouse gets its steaks. This is terrible but on the morning of Election Day I saw a mouse in my kitchen. It came out of a closed drawer near the floor and then it crawled back up from whence it came and vanished. Eeek! Double eeeek! It is like the time I found the worm on my carpet in San Diego. Well, not quite as bad as that. Leonard Pennario agreed with me that the worm story was the most gross thing in the world. There was nothing like that. But, this mouse. The weird thing about it is that just a moment earlier, I had been thinking about Robert Burns' poem "To a Mouse." Honest. I was by the shelf where I keep my spices and I was looking for paprika and for some reason that came into my head. "Wee, timorous beastie..." I was even thinking of that word "timorous." Was Burns being funny, I wondered, applying that stentorian Latin-root word to a mouse? Then I turned and I saw that mouse! Isn't that weird? Well, I am getting used to this kind of thing happening to me. Wow, check out the link above to "To a Mouse." You would think that on a Web site devoted to Robert Burns they would at least capitalize his name right and also not write "Burn's." Oh, well. That is a wee, tim'rous Web site, say I. On the bright side, one thing yesterday cracked me up. That was Bill, yesterday's commenter, telling me that Barack Obama had Leonard Pennario on his iPod. Bill, I was laughing all day about that! Plus, I enjoyed the dialogue that resulted. That is a progressive word, dialogue. I am going to use it every chance I get. Then this morning I saw the Wall Street Journal and it reminded me I am not alone. This woman who wrote the book "Prozac Nation" wrote about Obama's election and her essay began: "I cried, I admit it." I will recount my experiences in my book "Ambien Nation." Wow, what a night. They call it a historic election and they are right. Here is why: I wound up having to take an Ambien. I have not taken an Ambien in I do not know how long! I think it has been two years. That was when I had sleep problems and had to go to the sleep doctor because things got to the point where it was as if I flew to Europe three times a week. Heavens, that sentence! Perhaps the Ambien has still not worn off. The sleep doctor did not give me the Ambien. The sleep doc works without drugs. But the doctor before him did. And I still have a few left kicking around. I had not thought of them in forever. But lastnight, I did. A place for everything and everything in its place, is my motto, so I was easily able to find the Ambien on the lazy Susan in the kitchen, stashed among the baking powder, baking soda, allspice and vanilla extract. I made my own vanilla extract, with vodka and a vanilla bean from the Broadway Market. I am proud of myself. Half an Ambien, and boom. As soon as you swallow the thing you can feel something is off in your head. I mean, you feel that within two seconds. I walked up the stairs going "La, la, la, la, la..."
I have not even told Howard this, but I was dreaming about Barack Obama and in my dreams he was the greatest guy. We were out partying somewhere and the only trouble was that he left his gloves in the trunk of my car and I was not sure how I was going to get them to him. That is my way of wishing Obama the best and I wholeheartedly hope he succeeds as president, because what is good for his presidency is good for the country. That attitude is more than I saw from any liberals when Bush was elected four years ago, by the way. No liberals wished him the best. They just began immediately to hate him and rip him apart. But me, I am taking the high road! No. 1, I was not in love with John McCain anyway. If I had really loved the Republican candidate that would have been one thing. But this is another. No. 2, with the election over and the die cast, I can now not feel guilty for thinking about Leonard Pennario round the clock. We've listened to it a million times, but how 'bout Pennario, in that Ravel Toccata? I think I will take a few minutes and just sit and listen.